Home » Education Reform » We do a lot good in American education but why is opportunity to learn determined by where you live? 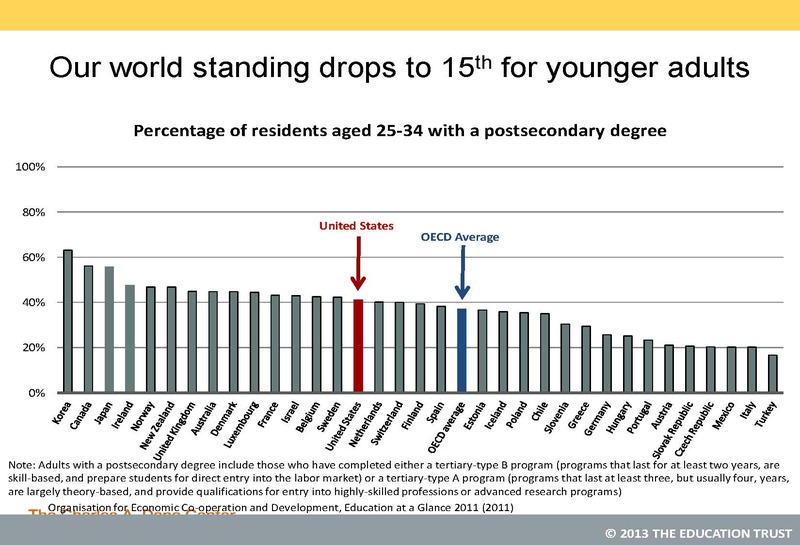 We do a lot good in American education but why is opportunity to learn determined by where you live? Uri Treisman is widely respected professor of mathematics and of public affairs at The University of Texas at Austin. He is the founder and executive director of the University’s Charles A. Dana Center. On April 19, 2013, he addressed the National Council of Teachers of Mathematics on equity in American education. He called his talk “Keeping Our Eyes on the Prize,” and called on his fellow math educators to work toward an education system in which students, regardless of ethnicity, family income or location in the country, have an equal opportunity to learn mathematics and thus gain access to good jobs and incomes. You should just sit down and watch this whole 50 minute talk. Prof. Treisman moves quickly, efficiently and entertainingly through the data (Here are his slides. You’ll need them.) to show that, yes, we have much work to do, but we’ve done a lot in recent decades as well. Below, I have pulled out the 20 minutes or so in which he presents the data on quality and equity in American education. I identify the point in the talk (3:30) and then, above the side he uses, sometimes paraphrase what he says but at other points, in quotes, transcribe his talk literally. My purpose here is not to fully replace listening to Prof. Treisman’s talk but to make certain points of the broadest interest easy to see and refer to. 8:23 The 2006 PISA results showed that we were 25th out of 30 countries, somewhere near Rwanda and Uganda, in mathematics performance. This was taken as fact. 9:00 At the same time, the TIMSS data came out and there was almost no attention to this at all. 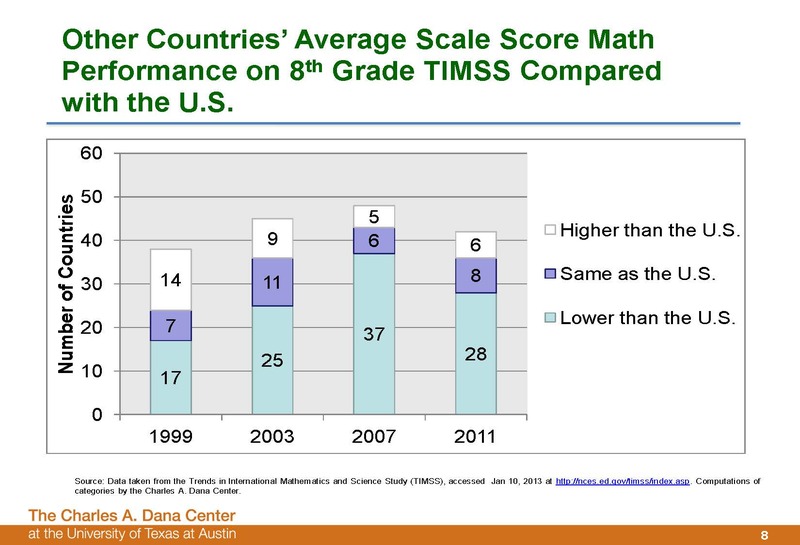 It showed that we had come a long way from the 1999 TIMSS and that there were only 5 or 6 countries that regularly outperformed the U.S. on TIMSS. Those were the high performing Asian countries. 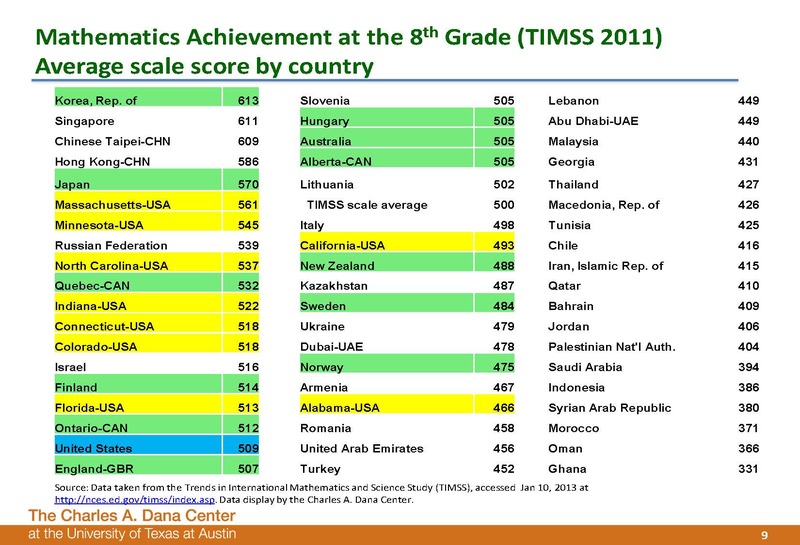 NOTE: The TIMSS and PISA tests are quite different from each other. TIMSS is meant to test what students have learned in school. PISA is more aligned with how European countries formulate their national educational standards and tests what a student can do with the knowledge she has. Here is a detailed comparison of the two tests that helps understand why the U.S. rank in each would differ. 10:00 In the last TIMSS, 9 states were oversampled so that they participated as countries. 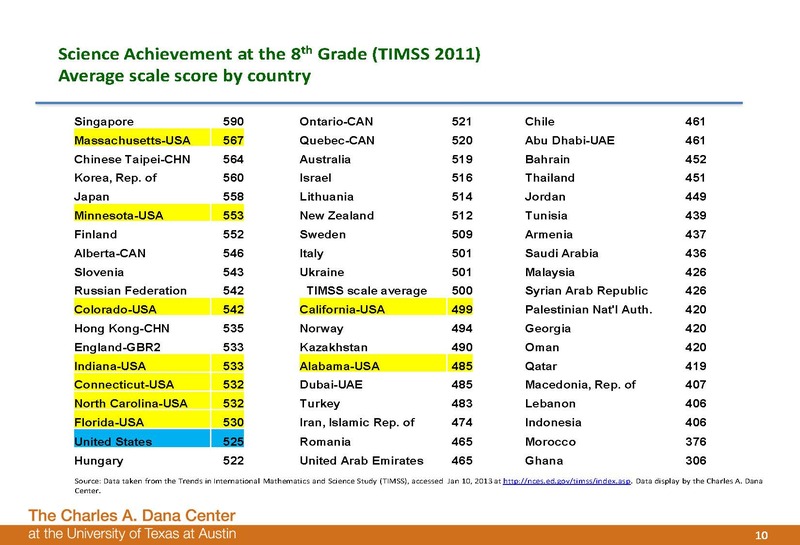 Green are the highest performing countries on PISA (not every PISA country participates in TIMSS). What we see is that Massachusetts and Minnesota do extremely well. And Whites and Asians in MA do as well as Hong Kong. So all of a sudden the argument is more complicated. Just as in 1999, whenWhite students in Texas did just as well as Japan, several states are among the high performers. Notice that Finland did as well as the U.S., underperforming many states. And some really high PISA performing countries like New Zealand underperformed CA, which is at the bottom of U.S. performance. 11:35 And when you look at science, you see the same thing. 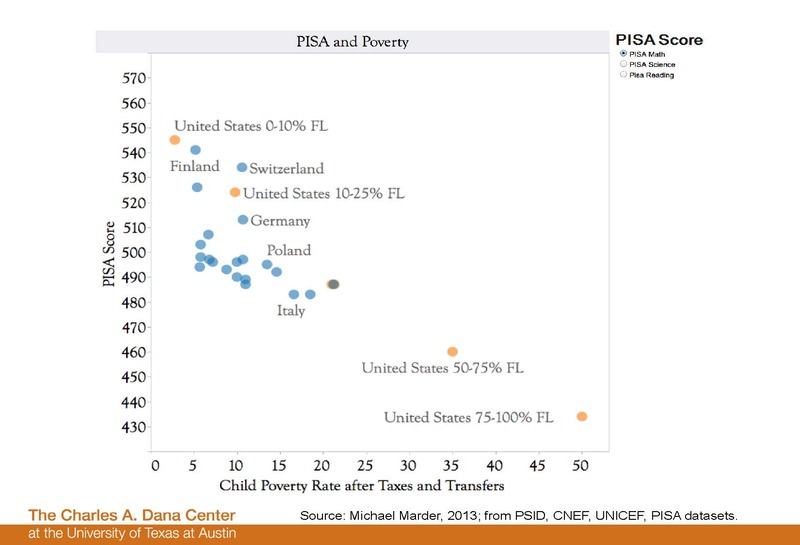 12:00 So, now, here is the PISA data for math performance disaggregated by child poverty rates. The yellow “United States 0-10% FL,” for instance, designates schools in which 0 to 10% of the children are qualified for free and reduced lunch (130% of poverty). is equivalent to a 4% poverty rate as figured by the OECD. So that is the portion of the US population that has rates of poverty comparable to, for instance, Finland. The US outperforms Finland in this category. The yellow “10-25% FL” dot is for the US kids at about 9% poverty rate. It out-performs Germany, which has a similar poverty rate. 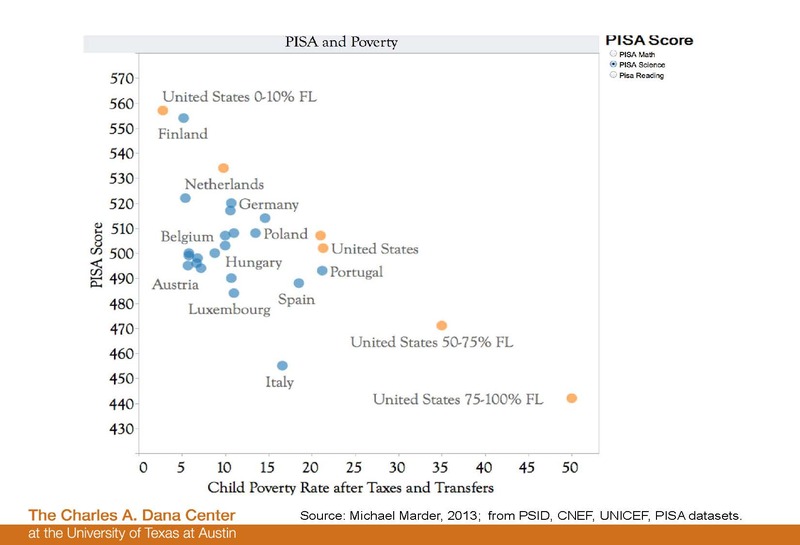 And you can see that, even on PISA, when you control for child poverty rates the US is pretty much at the top of the world. 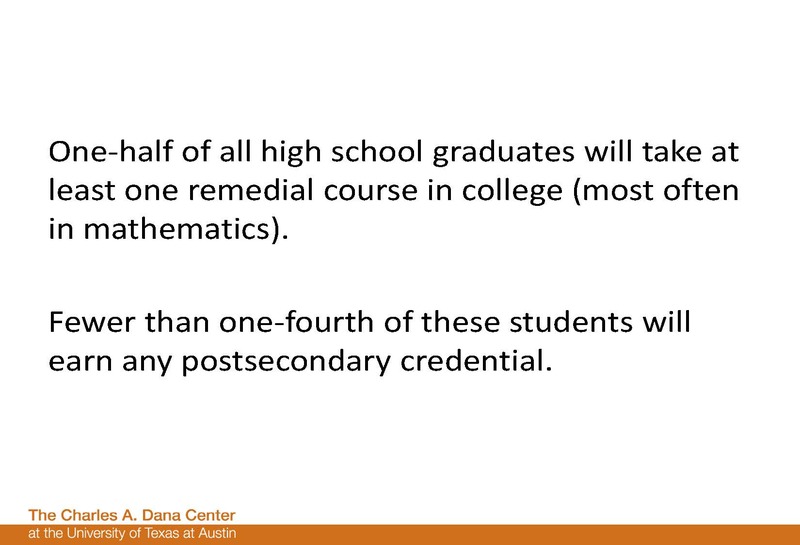 NOTE: A UT prof named Michael Marder made this slide. Here is his explanation of what is going on. And this post provides background on him. 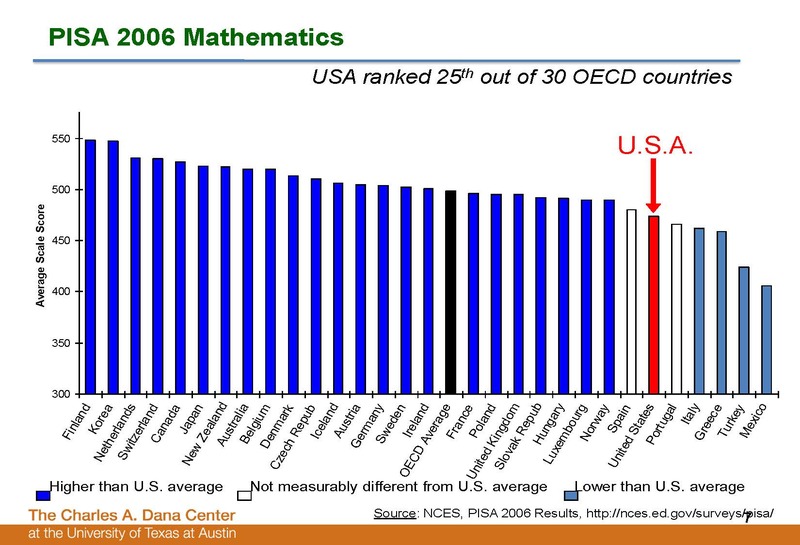 13:00 Even on science, the US is a high performer. 17:10 When we look at race, we see that we have been progressing across all ethnic groups but, still, we must focus on the equity dimensions of the problem. 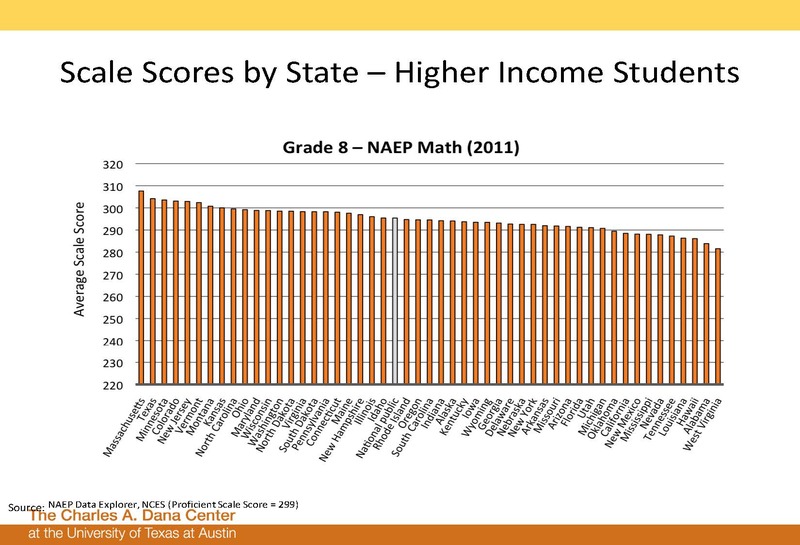 NOTE: NAEP is that National Assessment of Educational Progress. 20:10 “What else can we be proud of? [Look at the difference between] 2011…1996…15 years. Here’s 1996. 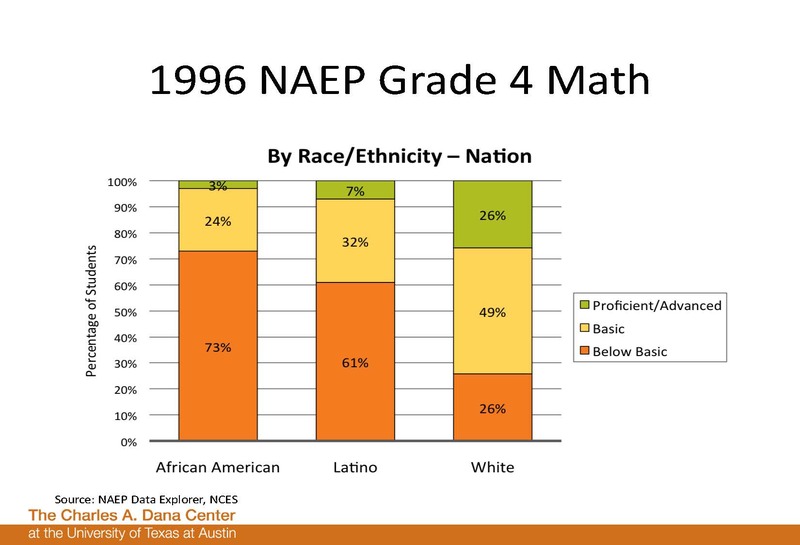 3% of African-Americans were proficient, 7% of Latinos, a quarter of Whites. Almost three quarters of Blacks were below basic, which means basically innumerate. In 15 years, 17% of African-Americans, 25% of Latinos and more than half of Whites are proficient, which is a very high bar internationally. Between a third and a quarter of Latinos are below basic – lots of room to get better, but massive improvement in 4th graders. Any of you been around for awhile and walked through elementary schools? You can see profound differences in achievement. 21:00 8th grade? Very similar. Latinos and African-Americans are 20 years behind Whites. In some states it’s 6-8 years. In others, if you project, it would be 40 years! That’s how powerful where you live shapes what you learn. 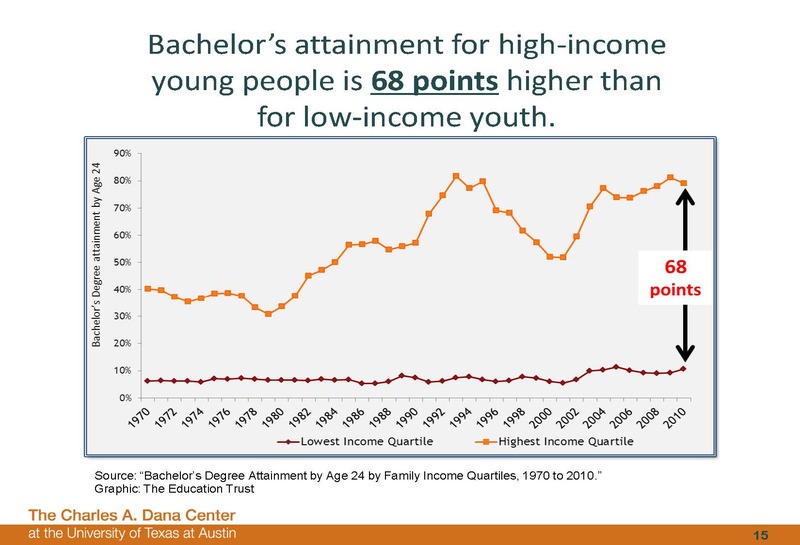 21:30 “Let’s just climb into this opportunity-to-learn gap a little more: 8th grade scores of low income children, free and reduced lunch. 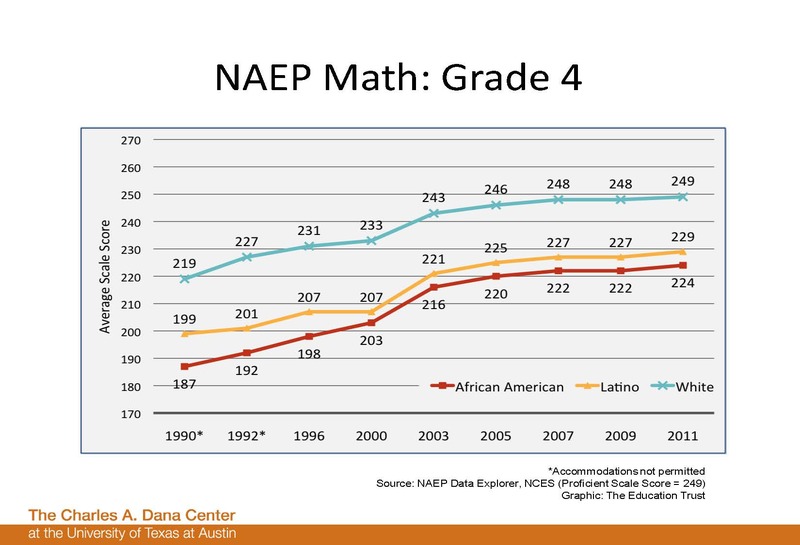 What does this graph show?” Remember that each bar is a full year of learning. Low income children in Texas, which is the top of the country….In California, low income children are two years behind. What about high income children. Massachusetts is 1, Texas is 2…California and West Virginia are at the bottom of the country…it’s about a year and a half difference for high income children, because family is a more important factor in what children learn for high income than for low income. 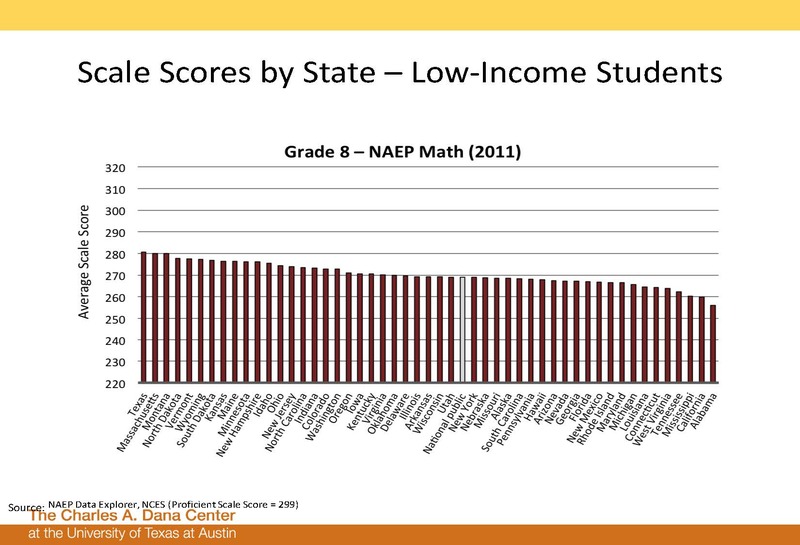 If you look at them side by side, you see that low income children in Texas perform as well as high income children in California and Alabama, etc. That’s how big a factor opportunity to learn plays. 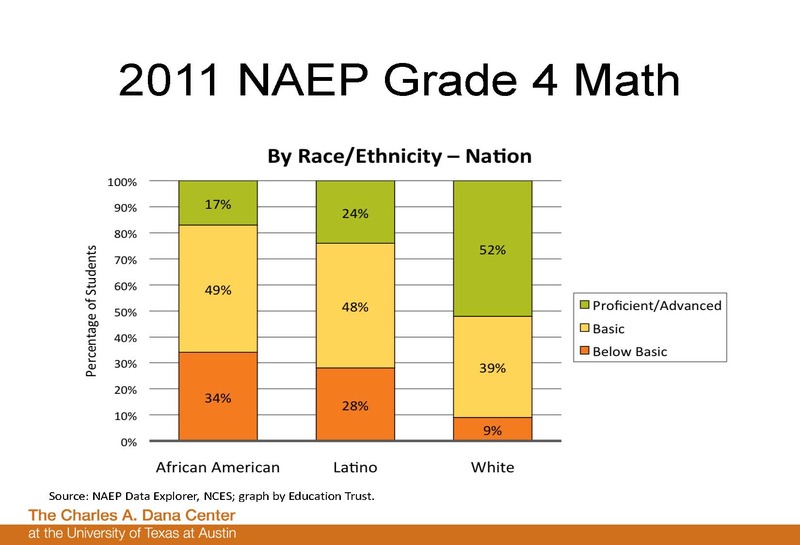 23:28 Here’s NAEP data showing the percentage of people who are proficient. 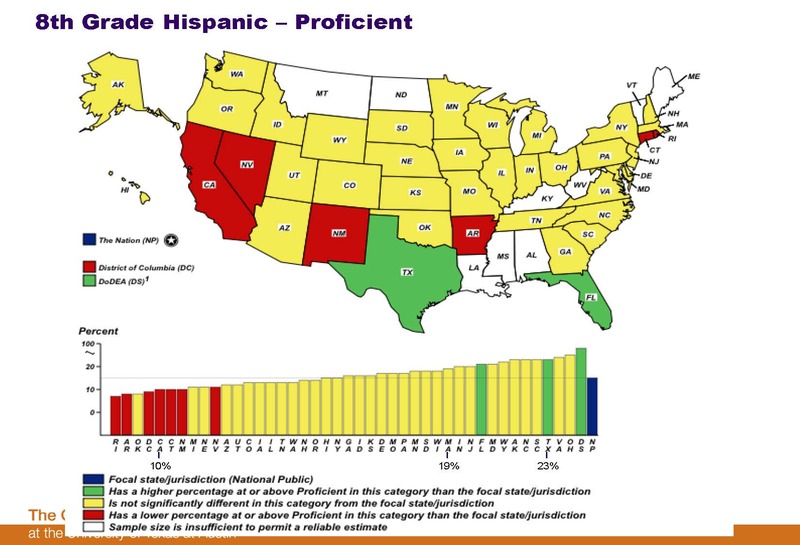 In California, 10% of Hispanics are proficient. 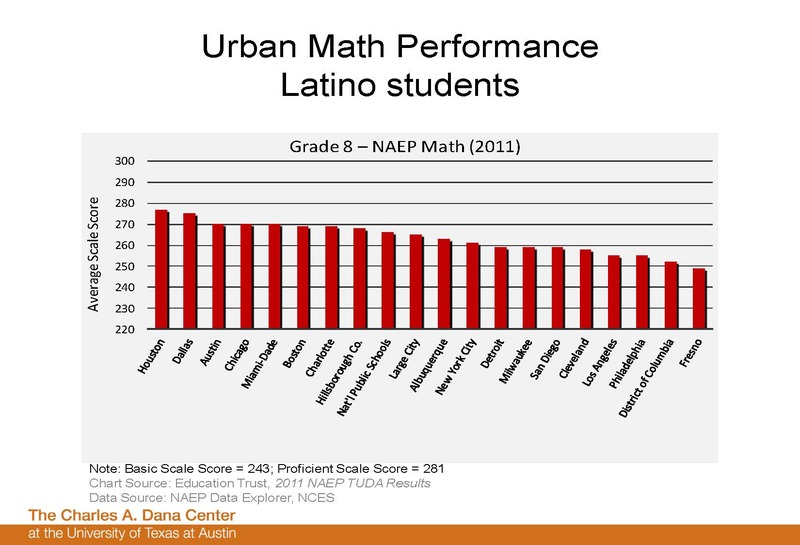 One quarter of Texas Hispanics are proficient…20% in Massachusetts. These aren’t small differences. These are massive differences in the opportunity to learn and they show up on virtually every test and every indicator. 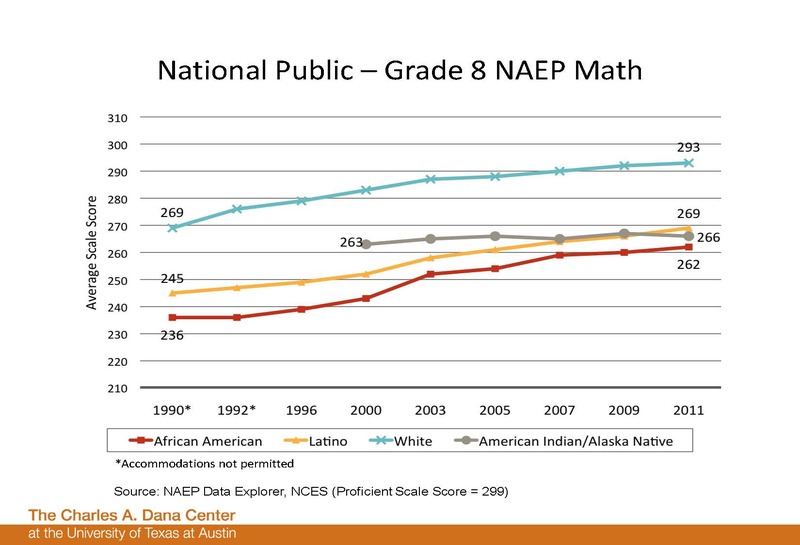 It’s not an artifact of NAEP. 24:15 Here’s the data for cities. Again, two and a half years difference in opportunity depending on where you happen to go to school. 25:00 “Now, what about opportunity to learn?” Here, in the second half of Prof. Treisman’s talk, he further discusses equity issues, pounding home the theme that the happenstance of a child’s location should not determine her opportunity to learn. This is a point often made by advocates of privatization. They emphasize school choice – charters and vouchers – as a solution where Prof. Treisman shows how to accomplish the goal in a more straightforward way by improving equity in public education. But it’s not just Finland. States like Massachusetts, Texas and many New Hampshire schools demonstrate that we do know how to provide all our kids an “opportunity to learn.” Prof. Treisman is urging us to get down to work. By ANHPE in Education Reform, Improving Education, International Comparison on May 28, 2013 .